Whether you are a true fashion connoisseur or not, you will certainly have noticed a widespread revival of the pattern in the last couple of years. From the classic and retro-inspired to cutting-edge computer-generated prints, patterns are back. And they’re everywhere. Literally everywhere, that is, since STUDIOLAV has now ingeniously decided to feature them on baked goods. 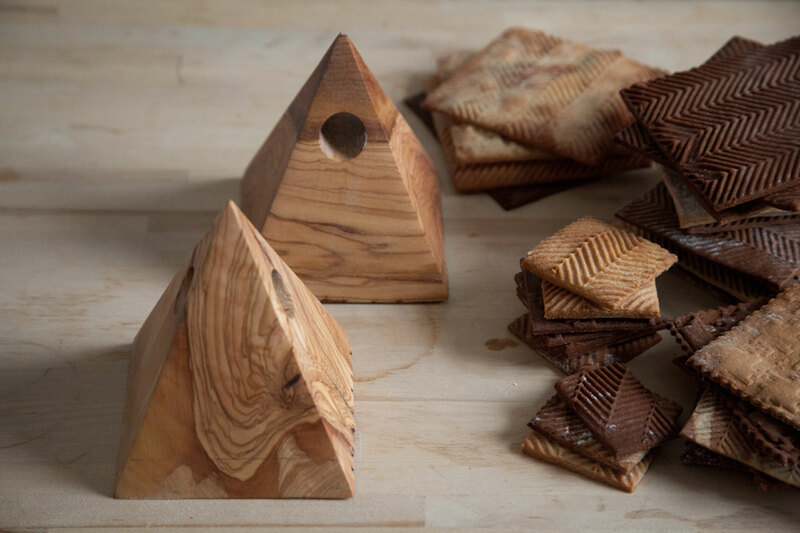 Designer Baking is the latest creation by the ever-exciting design innovators STUDIOLAV, a young and passionate multidisciplinary design studio founded by London-based product designers and Central Saint Martin’s graduates Loukas Angelou and Vasso Asfi. 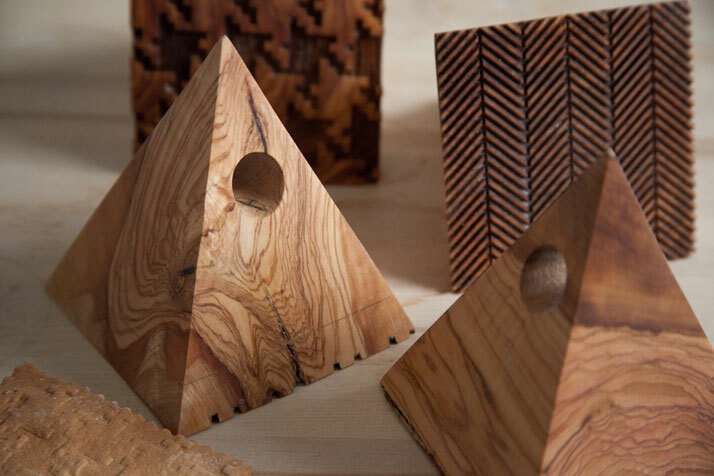 STUDIOLAV has come to be known for its playful and ironic approach to product design which reinterprets ideas, typologies and the way we see, as well as, use everyday objects. Pushing the boundaries in terms of perception of form and materiality, they create unique pieces that explore the emotional connection between people and objects in a playful narrative manner. Steadily emerging as a successful creative studio, they have worked as design consultants with clients including Habitat, Poliform, Bib&Sola, Vodafone, Lexmark and have collaborated with design studios such as VW+BS, Paul Cocksedge and Design Clarity. 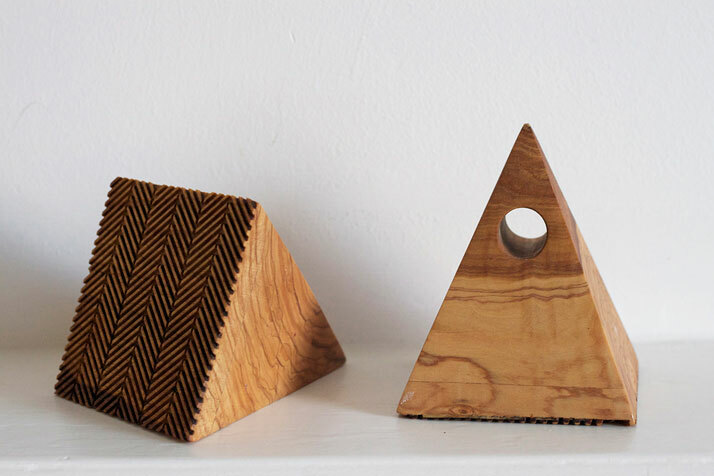 Their work has received critical acclaim and they have recently been shortlisted for the prestigious EDIDA award (Elle Decoration International Design Awards) under the category of Young Talent Designer of the Year 2013. 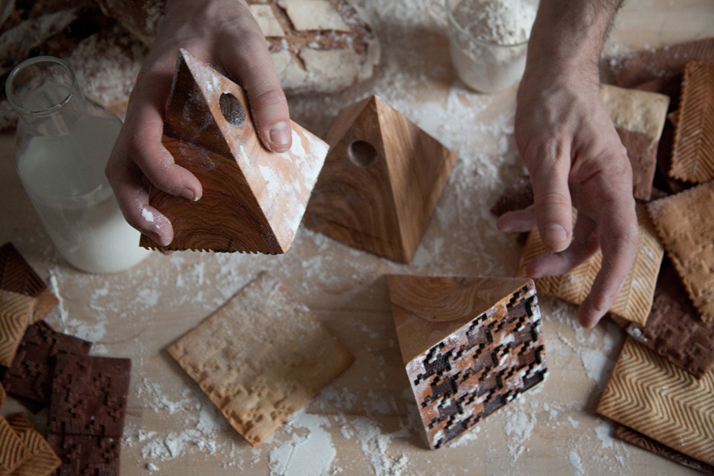 For their latest project, the duo created a two piece set of kitchen stamps that will gloriously transform everyday bread, cookies and pies into small ‘haute couture’ baking marvels. 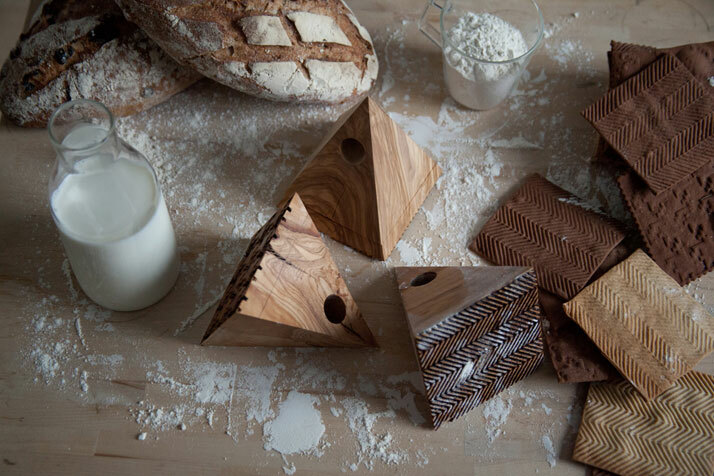 Inventively combining fashion with baking, the oh-so-luscious project is a response to the initiative from the Skoufa Gallery in Athens, Greece which invited designers to develop and re-imagine the essence of ‘folklore’ into a contemporary form where olive tree wood had to feature as the main material used. 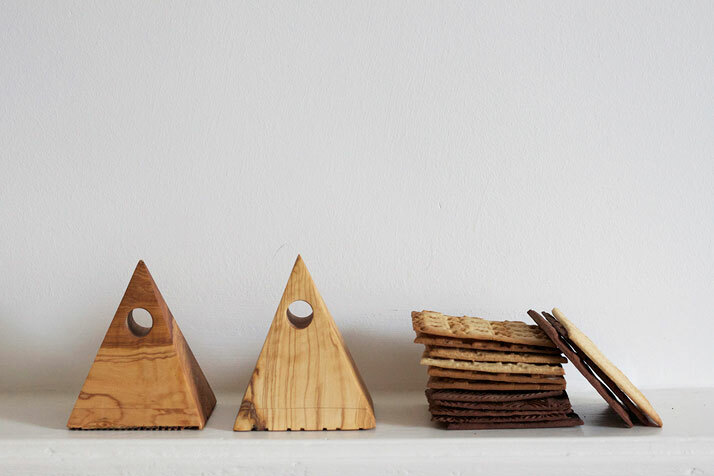 Inspired by the traditional quote 'bread and olive', STUDIOLAV imaginatively designed a set of pyramid-shaped kitchen stamps made out of solid olive wood. 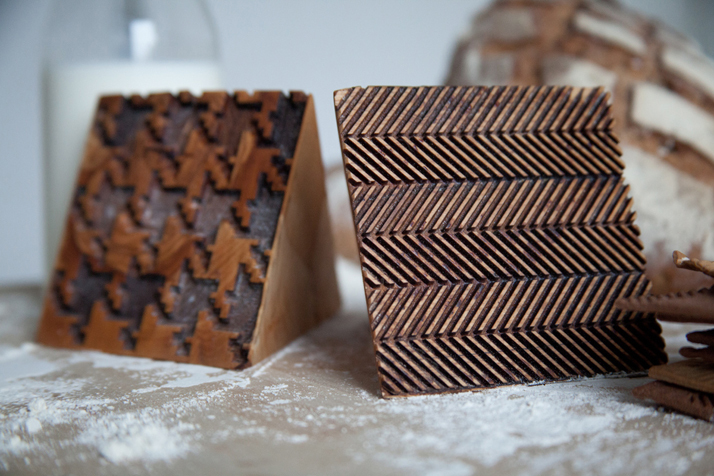 Reliefs of iconic fabric patterns such as ‘Pied de Poule’ (hounds tooth) and ‘Tweed Herringbone’ have been embossed on to the base of the stamps which imprint fabric patterns onto baked goods. Legendary descendants of great sartorial history, the two chosen patterns perfectly embody the overall theme of heritage and tradition that the project sets out to playfully explore. 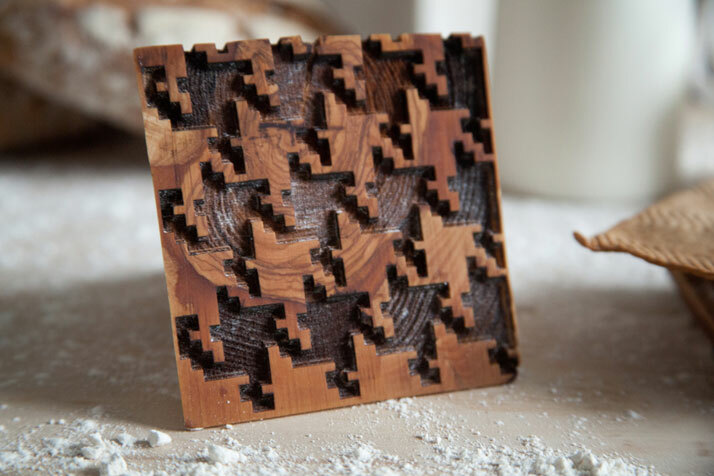 STUDIOLAV’s out of the (cookie) box thinking certainly appeals to fashion lovers and those with a sweet tooth alike. 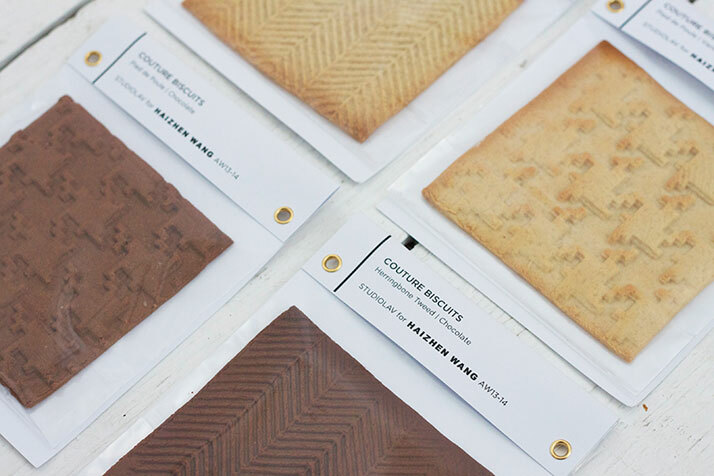 British fashion designer, and recipient of the 2012 Fashion Fringe Award, Haizhen Wang commissioned the duo for 200 biscuits to make up some of the contents of his front row goodie bags for his AW13/14 show at London Fashion Week. Delicious and stylish, we hear that they created quite a stir amongst the front row glitterati. Fashion has never tasted better.